If success were measured by the mile, the Nashville Bluegrass Band was sitting on top of the world. Touring was an endless succession of maps and motels. But they got to play the most popular festivals and shows all over the world, achieving cross-industry recognition — unheard of for a bluegrass band — and sold a heap of records at their performances. They loved the music they made, loved meeting new people on their journeys, and got along well most of the time. So they put up with traveling as hard as it was. Toward the end of 1999, all members of NBB had recorded tracks that would end up in a moderately successful movie featuring vintage music that received only minimal airplay. Who would have guessed that the O Brother Where Art Thou? soundtrack CD would ultimately sell over 7 million copies? NBB was an obvious choice for inclusion when the Country Music Hall of Fame and Museum held Down From The Mountain, its now-famous fundraiser, at the Ryman Auditorium on May 24, 2000. The concert, which featured the artists and musicians who recorded the music for O Brother, was videotaped for a documentary about the nature of its music. Down from the Mountain: Live Concert Performances by the Artists & Musicians of O Brother, Where Art Thou? would become a top seller as would a supporting release on compact disc containing complete versions of all songs performed that night. The concert's master of ceremonies was John Hartford. Mike Compton was especially visible at the concert, appearing on Shove That Hog's Foot Further in the Bed (a tune written by Ed Haley), Indian War Whoop, and Big Rock Candy Mountain with John Hartford. He also backed up the Cox Family and Gillian Welch on some of their tunes. This year NBB would entertain in cities like Pheonix, Denver and Richmond, Virginia. They played a three week Community Concert Tour through Pennsylvania, New Hamphire, Ohio, Indiana, Wisconsin, Michigan and Illinois. On its heels came another eleven day tour running through Missouri, Kansas, Nebraska, Montana and Wisconsin. They were headliners at MerleFest, the Strawberry Festival in Yosemite, and Memphis in May, and appeared on Prairie Home Companion, played the Woodstock, Illinois, Opry House, and performed at the Live Oak Festival. NBB performed a memorable concert in York, Pennsylvania, with Doc Watson. The band members were also instructors that year at the Bluegrass Academy at Rocky Grass in Lyons, Colorado. 2000 became a year for big changes. In November Gene Libbea decided to move to Denver to pursue some personal projects. He was replaced by Dennis Crouch, one of Nashville's first call acoustic bass players. The year brought unexpected bad news to Alan. His throat began to bother him in late Spring. "We were playing the Bluemont Series in the DC area, performing on the courthouse lawn," he remembers. "I had been a little sick, but we had to go on. Two weeks later in Annapolis, about three songs into the set, my voice disappeared... and it never came back." O'Bryant had developed a throat condition which interferes with his ability to control his voice. Various therapies have brought back his natural speaking voice but he says his best singing days are probably over. Alan still manages harmony parts well — one of the things NBB is famous for — but his range and power have limitations. Pat Enright and Mike Compton stepped up to the plate and covered more lead vocals. Harmony parts were rearranged. While the NBB sound may be somewhat different than it was in the 80s and 90s, few bands today nail harmony the way these men can. • Pat Enright, Mike Compton, Stuart Duncan > Platinum Album / O Brother Where Art Thou? • Pat Enright, Mike Compton, Stuart Duncan > GRAMMY AWARD: Best Compilation Soundtrack / O Brother Where Art Thou? In 2001, the awards began to roll in for Pat, Mike and Stuart. O Brother was a mega-hit. Everyone loved the refrain in I Am A Man of Constant Sorrow; though it didn't see a lot of airplay, the song can still be heard coming from many a live stage. This was the year NBB started to work on Twenty Year Blues. The Nashville Bluegrass Band was invited in the spring to play with the Nashville Chamber Orchestra in three performances of classical violinist Conni Elisor's composition Whiskey Before Breakfast: Partitas for Chamber Orchestra and String Band, which was taped for broadcast on Nashville Public Radio. In 2001, NBB visited Wintergrass, Chimney Rock and the Brandywine Folk Festival, and participated at Tacoma Academy. They were back on the Opry several times and guested on Prairie Home Companion again. They played fairs and show dates in Lincoln, Nebraska; Cherokee, North Carolina; Steeleville, Missouri; Hartford, Connecticut; Darrington, Washington; and Owings Mill, Maryland. NBB started the year as part of the O Brother Where Art Thou tour. The entourage traveled to sold out shows in Lexington, Atlanta, Newark, Philadephia, Boston, Washington DC, Toronto, Chicago, Minneapolis, Denver, Portland, Seattle, and Universal City, Cupertino and Berkeley, California. The movie, Down From The Mountain, had been released in June 2001. The Down From the Mountain tour would gross $10.4 million from 43 shows, drawing a total of 256,678 people, selling out 18 of 19 shows. 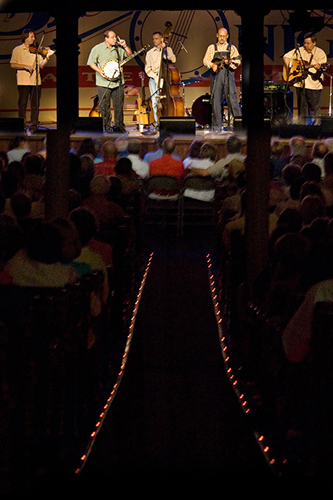 The tour ran from June 21 to August 22, ending with a SRO show at the Ryman Auditorium. It featured Patty Loveless, Ralph Stanley, Emmylou Harris, The Whites, Alison Krauss & Union Station and Norman Blake. Instead of providing their own backup bands, the tour's headliners used a common band made up primarily of players from the Nashville Bluegrass Band and Krauss' Union Station. This time, they visited Huntsville, New York City, Louisville, Ottawa, Cleveland, Cincinnatti, Austin, St. Louis, Bozeman, Shreveport, Sacratmento, Santa Barbara and other major cities. Tragedy struck twice during 2002. In the spring, Stuart lost his father. Then in late July Alan's wife, Cathy, passed away after her 18-month battle against breast cancer; Ron Block filled in onstage. This year NBB played Grass Valley, and appeared on Austin City Limits. They also played in Eugene and Sisters, Oregon. The boys played at Opyland, the IBMA FanFest and made several visits to the Grand Ole Opry. They were seen in Long Island, Bristol, Pauly's Island, South Carolina; Woodstock, New Jersey; and dozens of other towns. In November, NBB taped a performance at Fisk University for Bill Gaither's Gospel Bluegrass Homecoming, which would be released in early 2003. Mike Compton performed Gospel Plow. Private bookings picked up for the members of NBB. "2002 had just about killed us," O'Bryant recalls. Still they toured. Folks in Bel Air, Maryland; Princeton, New Jersey; Albany, New York all saw NBB performances in 2003 as well as Aspen, Colorado; Montgomery, Alabama; Woodstock and Lake Villa, Illinois; Bardstown and Morehead, Kentucky; Arcadia, Louisiana; Augusta and Hiawassee, Georgia; Tama, Iowa; and Swanzer, New Hampshire. They also played SPBGMA, MerleFest, and the Station Inn, and made several trips to the Grand Ole Opry stage. Though 2003 had been a little quieter for NBB, another blockbuster opportunity came along in the shape of The Great High Mountain Tour. Modeled after 2002’s extraordinarily successful Down From The Mountain tour, this series of bookings, which commenced in May 2004, took its name from Stanley’s arrangement of the traditional song Great High Mountain which Jack White recorded for Cold Mountain. This incarnation retained the flavor of the original but added enough new acts to make the show engaging for concertgoers who keep coming back for more. Alison Krauss and Ralph Stanley returned along with NBB, incorporating music from the movie O Brother with that of Cold Mountain. Artists who performed on the movie’s soundtrack included Stuart Duncan, who plays fiddle on the delightful Ruby With The Eyes That Sparkle. The show began with a 50-member choir of Sacred Harp Singers, including many local vocalists, demonstrating traditional shape note singing with a rousing version of I’m Going Home. Nearly three hours later, it concluded with another a cappella full ensemble performance, as Krauss led the cast through the gospel standard Talk About Suffering. The tour was another brainchild of T Bone Burnett. The full cast included: Union Station (Alison Krauss, Barry Bales, Ron Block, Jerry Douglas, Dan Tyminski), Nancy & Norman Blake, The Cox Family (Willard, Evelyn, Sydney, and Suzanne Cox), Dirk Powell and his wife Christine Balfa, Ralph Stanley, Tim Eriksen, Riley Baugus, The Whites (Buck, Sharon and Cheryl), Sierra and Cody Hull, Ollabelle, The Reeltime Travelers (Roy and Heidi Andrade, Martha Scanlan), from Johnson City, Tennessee. NBB performed Po Lazarus to many standing ovations. The two month tour through May and June took them to Columbus, Cincinnati, Chicago, Milwaulkee, Minneapolis, St. Louis, Detriot, Lexington, Greenville, Huntsville, New York City, Norfolk, Winston-Salem, Branson, Denver, Austin, Ft. Worth, Atlanta and a dozen other cities. 2004 also took the boys to Eureka Springs and Mountain View, Arkansas; Henderson, Kentucky; Charlottsville, Keeling, Wytheville and Blacksburg, Virginia; Lenore and Concord, North Carolina; Selma, Alabama; Rochester, Minnesota; Waldren, Akron and Dayton, Ohio; Sellersville, Pennsylvania; Alberta, Canada, and many points in between. They also also appeared at the Ozark Folk Festival, MerleFest and SPBGMA. On August 20, Sugar Hill released Twenty Year Blues. Produced by NBB, the album included a wide range of great songs from Jimmie Rodgers, Bill Carlisle, Bill Monroe, John Hartford, and The Mississippi Sheiks. In 2005, NBB played the Grand Ole Opry with Emmylou Harris, the Strawberry Festival in Yosemite, MerleFest, and the Lincoln Center in New York City. Though the band had slowed down, they still managed to play shows in Portland, Oregon; Lawrence, Kansas; Columbia, South Carolin; Cleveland, Rossville and Hiawassee, Georgia; Vista and Victorville, California; Norfolk, Virginia; Woodstown, New Jersey; Woodstock, Illinois; Romney, West Virginia; Salem, Virginia, and more. 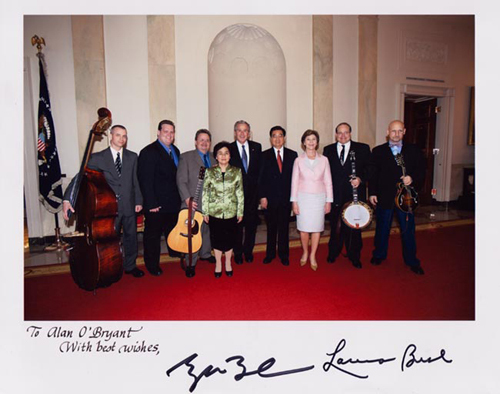 On April 20, the Nashville Bluegrass Band was invited to play a luncheon at the White House in honor of a visit by Chinese President Hu Jintao. NBB was selected because it was the first bluegrass band to play in Communist China in 1986, a time that very few foreign nationals, Americans in particular, were allowed into the country. “It is a wonderful honor to be asked to perform at the White House for such important guests," O'Bryant said. "This is important work... for a banjo player!” Aaron Till filled in on fiddle that day. Kid Pan Alley, CD produced by the Nashville Chamber Orchestra (now known as Orchestra Nashville), NBB backed Kathy Chiavola on a song written by Bill Lloyd, called Extra Hand. September found NBB in Cirencester, England, for a concert in the Cotswalds, where sheep are raised that provide wool for the royal family. NBB swung by Amsterdam, too. They were back in time to make the Hardly Strictly Bluegrass Festival in San Francisco in October. In 2006, NBB gave concerts in cities like Hamilton, Ohio; Bakersfield, California; Atlanta, Georgia; Richmond, Minnesota; Westford, Mississippi; Owings Mill, Maryland, and Cleveland, Ohio among others. They performed at IBMA, played the Grand Master Fiddle Championship, and took their usual seats at MerleFest. • In March, NBB traveled to Longford, England, for the Johnny Keenan Banjo Festival. At the Ryman's Bluegrass Night, opening for Earl Scruggs. Every album NBB has released since NARAS created the Bluegrass Album of the Year category in 1990 has been nominated for a Grammy Award. To date, the group has seen six nominations and two Grammy Awards, not to mention the Grammys awarded to Enright, Compton and Duncan for the Platinum O Brother. 2009 marks NBB's 25th anniversary. If any group has earned "Legendary" status, it's the Nashville Bluegrass Band. The five continue to explore fresh musical possibilities but remain firmly planted in the NBB tradition. "Our philosophy is that we've always existed for the people in the band, not the other way around," Alan O'Bryant. "We need this space in our individual pursuits to make it work. I'm a producer, making records, writing songs, working with other musicians. I'm a teacher as well. Mike is also teaching, Andy loves instrument repair, all of us have multiple ways we express ourselves. Although we love playing together, collectively as NBB we won't grow unless we grow as individuals." Alan says, "We're still gonna make records. We're still gonna tour. And we're still gonna be ourselves."